A few weeks ago I received a call from Google offering support in setting up an advertising campaign. A few minutes into the call, a dog started barking loudly, and not long after, the doorbell rang. It was obvious to me that the Google representative was a virtual employee working from home. When even technology behemoths like Google are on board, the trend is clear: Virtual Offices are here to stay. 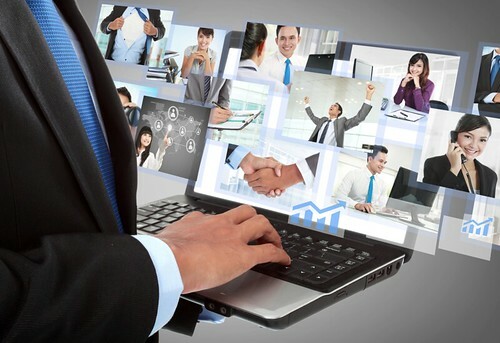 According to Global Workplace Analytics, there were over three million virtual workers in the United States in 2012. A virtual office allows principals and employees to work and maintain customer relationships from literally anywhere in the world. Through the use of virtual 800 telephone numbers, cloud computing, and other tools, virtual offices can be just as efficient as their traditional brick-and-mortar counterparts. The specific tools your company may choose to fulfill these functions will depend upon your needs, size, budget, reach, workflow, and a host of other factors. Strong project management is critical when team members work remotely. Every project must be broken down into individual tasks and milestones. The tasks must be delegated, progress must be monitored and everyone involved in a project must be able to see what others are working on at any given moment in time. Project management software like Podio and Basecamp are popular choices for virtual collaboration. Podio is incredibly versatile and cost-efficient. There are free plans available, and a small business plan for just $9 per month. Customized enterprise-level plans are also available for larger businesses. Podio allows you to set up custom workspaces into which you can invite team members and clients. Podio is also able to be used to manage leads and customer data. The application can be accessed from mobile devices and the tools can be integrated with GoTo Meeting, DropBox, Google Apps, and other popular cloud-based software. Basecamp is another popular collaboration tool. It costs a bit more than Podio, but is less costly than some other tools – the lowest plan will run you $20 per month. Basecamp is very fast and the support team is efficient, which is why it has become so popular in recent years. No matter what type of collaboration software you choose, the benefits can be felt almost immediately. When your team can collaborate in a central location, everyone will know the precise status of a project in real time, even if they are on completely different work schedules. Nobody will be left out of an email thread, because all communication can happen in one central location, documents won’t get lost in the shuffle, and projects can be accessed from anywhere in the world. Don’t be afraid to ask questions and test all functions of the software before making a commitment. Although phones, email, and web conferencing software allow you to communicate in real-time, the nuances of interpersonal communication can be lost over air and data lines. And communication with customers who might be located thousands of miles and several time zones away can also be challenging, especially if your organization is small. But the right tools can ensure that no customer communication is ever missed, even if your customers are located halfway around the world. Toll free numbers and call forwarding are a great way to stay connected to clients, potential clients, and remote employees. 800 numbers give your business credibility and allow people to reach you wherever they may be located, without paying toll charges. Years ago toll-free numbers were only for well-established businesses. But 800 numbers and associated services are now incredibly affordable and come with a variety of customizable options, even if your business doesn’t have a landline or even an office. You don’t have to go to the telephone company to set one up, either. There are tech companies that specialize in virtual toll free numbers. They allow businesses to use toll free numbers over data lines, forwarding calls to the office or even cell phones. Customized menus and greetings can be set up, and some services even give you access to call centers. Multiple 800 numbers can even be set up to help a business establish a presence in several different countries. For a fraction of the cost of setting up your own call center or international office, you can ensure that no customer calls ever fall through the cracks. The challenges of a global virtual office are many, but they are easy to overcome with the right tools and technology. When team members can communicate, collaborate, and share information quickly, a virtual office can be just as efficient (if not more so) than a traditional brick-and-mortar corporate office setting. Just remember to leave the puppy in the yard before your important conference call!